With only 32,000 miles on the clock, we’re surprised this original Audi Quattro doesn’t have a higher bid estimate. It’s usually the exotics selling for astronomical amounts that attract the most attention at car auctions, but occasionally we come across rarities that are surprisingly affordable. Like this practically pristine 1991 Audi Quattro, for example. Of course, the Quattro name is synonymous with its rallying pedigree, making the road-going version popular among car collectors. With that in mind, we’re surprised this example going under the hammer via Classic Car Auctions doesn’t have a higher bid estimate. Only 11,000 examples of the Audi Quattro were produced between 1982 and 1991, so they’re not very common. What makes this particular UK-spec Quattro so special, however, is that everything is still in original condition, from the engine bay to the interior. It looks stunning finished in Tornado Red, and the interior is also completely original. As this is a later model, this Quattro features a three-spoke steering wheel design, as well as leather covered door arm rests, glove boxes, center console, door pockets and partial leather seats with 'quattro' script upholstery. It even has an old-school cassette player. Only two previous owners have had the privilege of taming this classic Quattro in 25 years. In that time, it's only racked up 32,233 miles. Power is provided by the original 2.2-liter inline-five engine. When it was new, it would produce around 217 horsepower and reach a top speed of 143 mph. "Finding an original 20 V Quattro is hard enough in the current marketplace, but one with low mileage is a truly special proposition," said Richard Greenhalgh, classic car specialist at Classic Car Auctions. "With world rally winning pedigree and a growing cult status, the demand for low-mileage Quattros is surely going to increase for many years to come." It's estimated that the Quattro will sell for between 35,000 and 40,000 GBP ($45,220 to $51,000) when it crosses the auction block on September 23. Considering its condition, that seems criminally cheap, and could be a very wise investment as its value will no doubt continue to increase in the coming years. 2018 Audi RS5 First Look Review: Is It Still A Sports Coupe? It doesn't tick any of the old sports car boxes. Although we suspect it's just a matter of time. 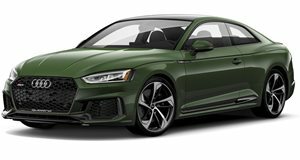 2018 Audi RS5 Coupe Test Drive Review: Vorsprung Durch Technik Or A Step Backwards? Is ditching the V8 and downsizing to a turbocharged V6 the RS5’s chance to shine?